There is always something any FlyBaby can glean from the cool testimonials we are receiving. Right now I want to talk about some ways I can help you as Payroll FlyBabies. 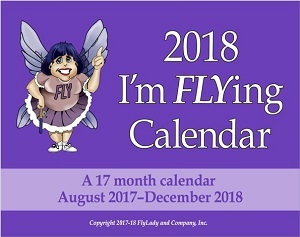 Keep in mind that I wish all my FlyBabies acted as if they were Payroll FlyBabies. Homeschoolers these will help you too. The problem with most of us; If we have all day to get something done, we will take all day. Think about this! A teacher gets out for summer and is determined to get organized. August rolls around and nothing has been done. She starts back to school looking forward to the first long weekend. Nurses do the same thing with their swing shifts. Every few weeks they have a whole week off. They try to cram everything they want to get done into that one week. Imagine not living this way. It can be done. We have to teach you to stop putting out fires and to think ahead. Your perfectionism makes you think you have to clean for eight hours to get a clean home. You don’t see how doing just a little at a time is going to make a difference. This is your perfectionism again! When you let go of your perfectionism you can begin to do things because you have two minutes. Housework done incorrectly still gets done. When I say incorrectly I mean not like you were taught! This is your home. Some days I spend two minute doing my floors. Are they perfect? NO! But they better than they were. Utilizing available small amounts of time even if it is just two minutes is better than procrastinating and allow the task to pile up till it is driving you nuts. Here are some tips for all you Payroll FlyBabies.Pick out your clothes for tomorrow! Do this when you take your clothes off. 1. Don’t dilly dally getting dressed in the morning! 2. Go to bed at a decent hour to get 8 hours of sleep. 3. Use a calendar that the whole family can see. It will quiet a lot of questions. 4. Use an Office in a Bag to do some planning on your breaks at work: Menu Planning, sending out birthday cards, paying bills, grocery list, and holiday planning. 6. Don’t spend all day on Saturday cleaning. Commit to doing simple routines, our daily mission, and declutter each day in the zone we are in. 7. Pick up after yourself as you get dressed in the morning and as you are cooking. 8. Make your bed right when you get out of it. Pull the covers up to your chin and make a snow angel and slide out the side. Boom you have a made bed. 9. Go to bed with a shiny sink. Get your coffee ready to go in the evening. It will save you a lot of money and time in the morning. The next morning all you have to do is hit the start button; unless you have a timer coffee maker. Just remember to put the carafe under the drip. Don’t ask me why I know that. 10. Establish a launch pad. As part of your before bed routine; place all the things you will need for tomorrow on the launch pad. Make sure the children’s things are there too. 11. Check your calendar to see what everyone is doing tomorrow. This will help you put things on the launch pad. 12. Put on your lace up shoes when you get dressed. Make sure your dress shoes are at the launch pad. Take them with you in a tote bag and change before you go into work. 13. Take everything out of your car when you get home from work. 14. Use your Crockpot, Bread Machine, or One Pot. They will make you feel like you have someone at home cooking for you. 15. When you cut up vegetables; cut up extra for later. Plan your menus around what needs to be cooked. 16. Make two meatloaves when you make one for dinner. Freeze one. 17. Brown 5 pounds hamburger meat in your crockpot with onions and a little water(1/2 cup) and stir. Let cool and bag up and freeze for a quick dinner solution. 18. Plan for leftovers for your lunch. It all about thinking ahead instead of just putting out fires. Every minute you save yourself, it compounds in more time for the special things in life. You can become the envy of all your working friends by just following a few of these tips. A family who checks the same calendar always knows what’s next and what’s for dinner. Place your calendar where the whole family can see it! Don’t hide it from them. Our calendar has huge squares large enough to hold your family’s busy schedule. This entry was posted in Morning Musing and tagged flylady, get organized, homeschoolers, payroll. Bookmark the permalink.